You Have Eevolved Into Vaporeon! Vaporeon is an eeveelution that is never a “fish out of water” – the highly adaptive, mysterious, and powerful Pokémon thrives both on the land and in the deep of the sea! Because you got Vaporeon, you are a person who can get along with almost anyone. Despite having a wealth of hidden personality, new friends gravitate toward you. You are comfortable in most any environment, but prefer to be in somewhere familiar. As a Vaporeon, you are a truly lovable ‘Jack of All Trades! Is it a fish? Is it a cat? Or a fox? At home in the water? Land-based? This eeveelution is shrouded in well-deserved mystery. A fortunate trainer can gain access to a whimsical Vaporeon when their Eevee is exposed to a Water Stone. With a single use, the transformation begins. Vaporeon made its first major appearance in the Pokemon TV show episode, The Battling Eevee Brothers, with the trainer Rainer as its owner. Ash, the series’ main protagonist, got to experience the water-type wrath of a strong Vaporeon firsthand in his entrance exam of The Ultimate Test. In battling Vaporeon, Ash hoped to move forward in the prestigious Pokemon League. Vaporeon has a plethora of other major anime appearances. It can be seen in 1) Mewtwo Strikes Back, as owned by the trainer Fergus. This particular Vaporeon was captured by the malicious Mewtwo and cloned without its trainer consent. The very same clone can be seen yet again in the sequel, Mewtwo Returns; 2) Espeon, Not Included and Trouble’s Brewing, belonging to one of the trainers entitled the Kimono Sisters; 3) On Olden Pond, as owned by a meek old woman named Galea; 4) Last Call, First Round!, during the Sinnoh Grand Festival. In this episode, the trainer Ursula’s Eevee evolves in a climactic event; 5) Mystery on a Deserted Island, as the result of one of the three Eevee that were on-shore; 6) Eevee and Friends and Team Eevee and the Pokemon Rescue Squad!, alongside other eeveelutions. In addition to these major appearances, Vaporeon has made several minor appearances in The Power of One, The Legend of Thunder!, A Family That Battles Together Stays Together, and Destiny Deoxys. Of all of the eeveelutions, Vaporeon might be the most popular – and as a result, it has the most show appearances of any of the eeveelutions. It is a composite Pokemon in such a way that it shares physical traits with land and aquatic animals. This explains why it has the tail of a fish and front paws of a cat. It has a face of a common house cat but has ears like fins. You can easily spot a Vaporeon by its light blue body – not unlike the color of the ocean. Vaporeon has this sheen because its molecular structure is mainly composed of water. Just like waves in a sunset, a Vaporeon’s body will glitter when sunlight hits it. Such a powerful Pokemon is blessed to be equally as magnificent. 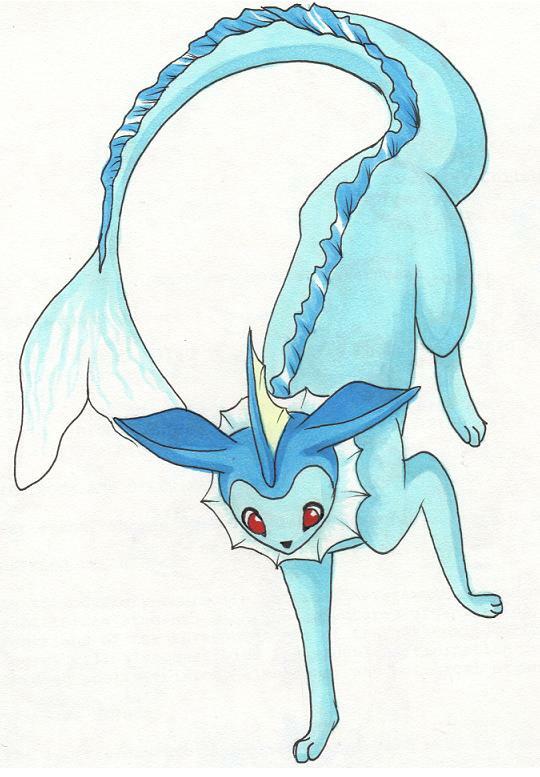 Competitively, Vaporeon’s main ability is Water Absorb. A rival trainer can’t expect to hit this Pokemon with a water-type move and expect to tell of a victory! Vaporeon will absorb any H2O and use it to mend itself. No matter the circumstances or environment, it is highly adaptive. It is the only eeveelution known to be able to breath underwater. Vaporeon is the most popular choice for trainers looking for a majestic friend and powerful battle companion. Because of these reasons, Vaporeon is a wonderful eeveelution choice!